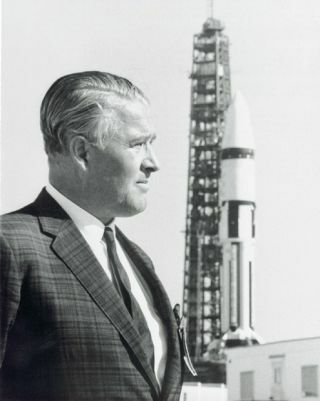 Dr. Wernher von Braun stands in front of a Saturn IB launch vehicle. In this historical photo from the U.S. space agency, Dr. Wernher von Braun stands in front of a Saturn IB launch vehicle at Kennedy Space Flight Center on Jan. 22, 1968. Dr. von Braun led a team of German rocket scientists, called the Rocket Team, to the United States, first to Fort Bliss/White Sands, later being transferred to the Army Ballistic Missile Agency at Redstone Arsenal in Huntsville, Alabama. They were further transferred to the newly established NASA/Marshall Space Flight Center (MSFC) in Huntsville, Alabama in 1960, and Dr. von Braun became the first Center Director. Under von Braun's direction, MSFC developed the Mercury-Redstone, which put the first American in space; and later the Saturn rockets, Saturn I, Saturn IB, and Saturn V. The Saturn V launch vehicle put the first human on the surface of the Moon, and a modified Saturn V vehicle placed Skylab, the first United States' experimental space station, into Earth orbit. Dr. von Braun was MSFC Director from July 1960 to February 1970.